Author Rick Merizon and his dad, 1984. This story is more a tribute of sorts. I’d like to tip my hat to the beautiful season on which we have recently embarked…fall. This is my favorite season of the year and sadly one of the shortest in Alaska. The pungent aroma of yellowing leaves has begun to fill the air, the perennial cronk of sandhill cranes overhead soon will catch our ears while out doing yardwork, and the cool, crisp morning air will make us grip our warm cup of coffee a bit tighter. As most of the salmon runs are waning, many of us have begun to look excitedly towards the numerous big and small game hunting opportunities that abound in this amazing state. More than the season, however, I’d really like to pay tribute to those in our lives that took the time to be a mentor and take us into the outdoors during this fantastic season. For me, this was my dad, brother, and friends. 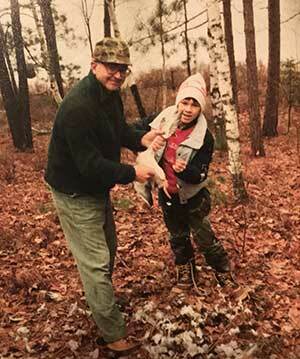 For virtually every September and October of my childhood, my dad would pick me up on a Friday afternoon from school, drive the three and a half hours to our small lakeside cabin in the woods, and show me the value of time spent with friends and family during the fall waterfowl and grouse seasons. While trying to pass the time on those Friday evening drives, I’d anticipate the early, star-filled mornings puttering out across the cold lake nestled on top of a bed of duck decoys. I’d imagine that this year the woods were going to be filled with ruffed grouse and my aim would be true. But most of all, I’d anticipate yet another laughter-filled weekend that would be far too brief but always surrounded by the beauty of the piney north woods. Those bonds and laughter-filled memories will last a lifetime. Because of my childhood mentors, I feel extremely fortunate to have already had many decades of memories and laughter and hopefully might have a few more. I hope my own kids can look back on their childhood with the same joyous memories of quality time spent together. I am a walking, talking, example of what this mentorship can germinate as I now work for the Alaska Department of Fish and Game (ADF&G) to hopefully give something back to these valuable resources that helped shape my life. 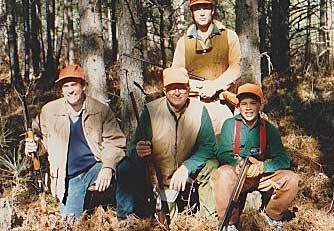 Rick Merizon and fellow hunters in 1985. Despite the short fall season in Alaska, we are extremely lucky to have many opportunities to hunt grouse, ptarmigan, hare, and waterfowl with a new or less experienced hunter. Virtually everywhere in Alaska there are opportunities to hunt at least one of our seven species of native upland birds, two species of native hares, or numerous species of migrating waterfowl. Ruffed, sharp-tailed, sooty, or spruce grouse inhabit the forested and open areas at lower elevation throughout most of Alaska. Rock, white-tailed, and willow ptarmigan inhabit tundra and alpine areas at higher elevations or higher latitudes throughout all of Alaska. Many of these species are often easily spotted and are quite approachable, making them very rewarding opportunities for new and less experienced hunters. Alaska small game hunting regulations are easy to understand, afford very long seasons, and liberal bag limits allowing for a high degree of flexibility in scheduling a hunt. Hunting small game in Alaska can be accomplished with very little time or gear investment and can thus afford a wonderful opportunity as a mentor to make it fun, exciting, and easy. However, some of the best experiences shared among friends and family are while cleaning, preparing, and enjoying the delicious game meat that one has recently harvested. This fall, my goal is to take a new outdoor enthusiast afield in hopes of mentoring them through their first hunt. Much like my dad did with me when I was 12, my hunter this fall is my own 12 year old son. He completed the ADF&G Basic Hunter Education course, we’ve spent a lot of time at our local rifle range practicing safety and marksmanship, and if it’s possible, I think I may be more excited for his hunt than any other hunt I’ve pursued myself. I only hope I can provide the same wisdom and patience my father showed me all those years ago. So, here’s to all of the individuals out there that have already taken precious time out of their busy schedules to be a mentor in the outdoors. Thank you for your efforts. Thank you for planning, purchasing gear, and preparing for the hunt. Thanks for checking the weather early in the morning and making a thermos of hot chocolate before 5am. Thank you for showing us how to clean our harvested game. Thank you for teaching us ethical hunting practices and safely handling a firearm. Thank you for showing and immersing us in the beauty of our natural world and paying its due reverence. But most of all thank you for the friendship, memories, and the laughter…I will forever be indebted to you. 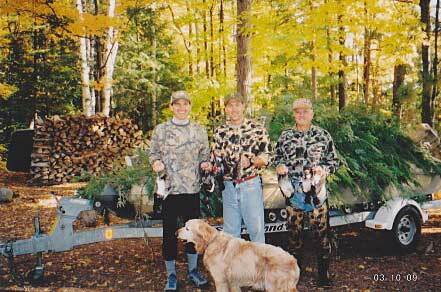 Rick Merizon and fellow hunters Fritz and dad, 2005. Go out my friends and enjoy this beautiful season and all the bounty that Alaska has to offer. The season is brief but the impact you have on a new or less experienced hunter will change lives and leave a lasting impression. Hatcher Pass Youth Hunt Management Area (Unit 14A): This area is open to youth between 10 and 25 August. Skilak Loop Management Area (Unit 15A): This area is open to youth each Saturday and Sunday between November 1 through December 31. Check the regulation booklet for more details on area descriptions and any other restrictions. Rick Merizon coordinates the small game program for the Division of Wildlife Conservation. He conducts research on hares, grouse and ptarmigan.